The third house we completed in 1979 we called the Bear River (there are a lot of rivers in our neck of the woods, but this is one we had an up-close and personal with–blackberrying one summer’s evening on a hill above it when we noticed a namesake bear foraging on the other side of the patch.). The house was covered in grey drop siding, and featured the 3 B’s—balconies, back porch and basement, all of which made it fun for us. One day, about mid-way through, while slaving away in the studio, we got a call from the customer, asking us out for lunch. My reaction was probably stunned silence, as she lived in California, and hadn’t mentioned coming our way. Plus, who had time for lunch? “We’re circling your house right now! We’ll land in Astoria and get a ride over. Should be there in about an hour.” That gave me an hour to tidy up ourselves and the house. The logistics of their arrival were beyond me, but all went as she had envisioned (they’d managed to talk someone wandering around the tiny airport into loaning them a car), and we celebrated at the one fancy restaurant in town. (This was the same restaurant Noel moonlighted in one summer as biscuit-maker, staff cook and dessert tester. It was there he discovered his dyslexia, while trying to pair up the number of biscuits slated for each diner with the number of people at the table—the customers and staff always came out ahead). Faux drop siding was an exterior solution we came up with early on, as it was featured on many of the full-size houses in our area. The real thing consisted of horizontal boards tongued and grooved so that the lower edge of each board interlocks with a groove in the board immediately below it. In our version Noel cut ½”w X 1/16th thick cedar boards that I beveled the top of on the Dremel scroll saw sander. We then glued them on the 1/4″ plywood walls, with Elmer’s white glue, with the bevel at the top, and each board spaced about 1/16th” apart. A little of the plywood walls showed, but the spaces were narrow enough that the grain wasn’t obvious, especially once the house was painted. The overall look gave the illusion of the real thing, without the tedious and bulky details of tongue and groove. That’s what so great about houses compared to, say furnishings—there’s so much detail on a house that no one holds the “cheats” against you. The back porch was an “add-on,” so the siding was the less expensive board and batten—3/16 battens glued to the ply walls, with some decorative shapes and chevrons to fancy it up. 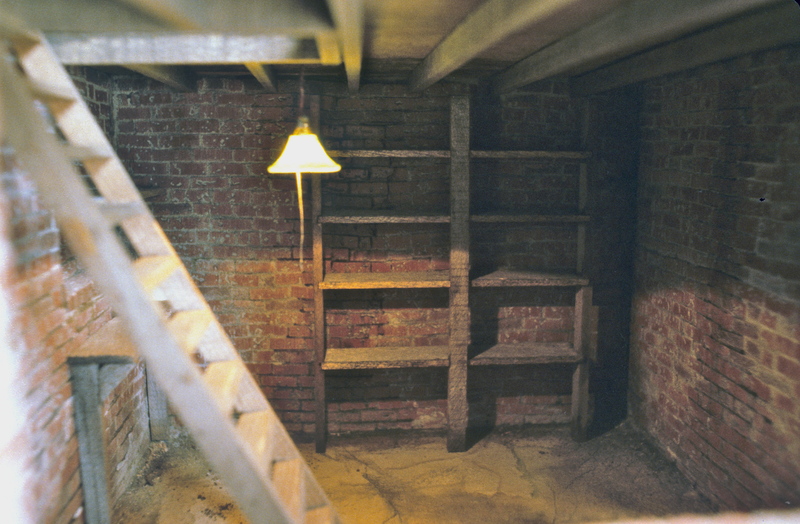 Inside was a trapdoor down to the basement, with ladder-type stars and shelving made from our termite wood, a cracked cement floor and brick walls. There’s an opening under the porch for viewing the basement. The house also contains a small, secret room, behind a movable panel, as do many of our houses, but we’ve mostly forgotten which ones. The only reason I remember this had one is because the owner called about 6 months later, late at night, to say she’d just found it. We loved that it had taken her so long. 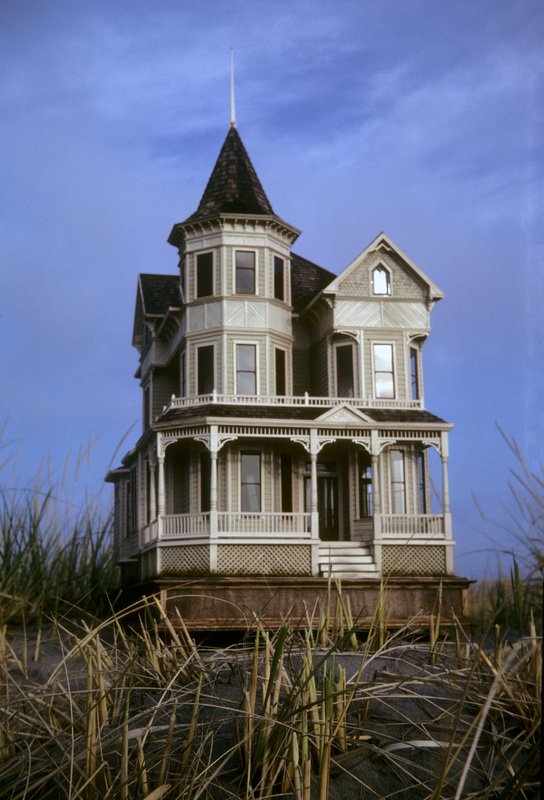 This entry was posted in Houses, Miniatures and tagged architecture, arts, basements, collectors, dollhouses, lifestyle, miniatures, Victorian architecture, work style. Bookmark the permalink. Lovely house! Love the design. 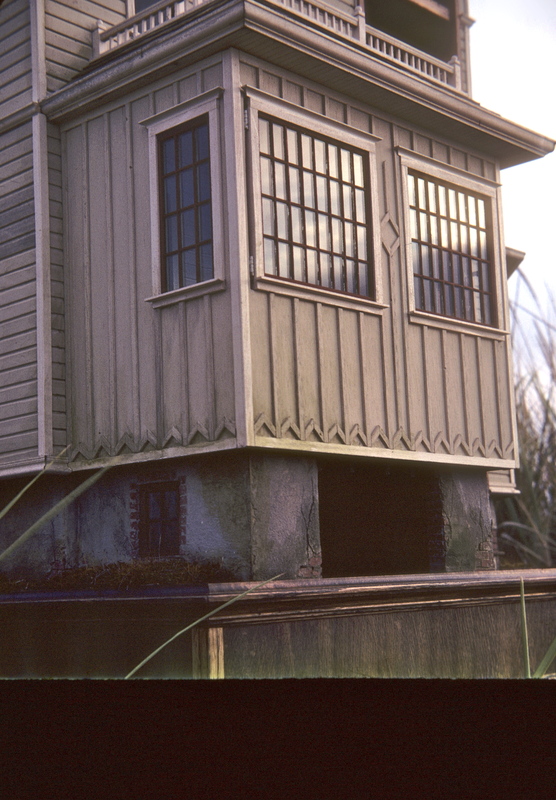 I just found a picture of a house that I think you need to create in miniature (even though you’re retired now) — a new challenge in aging techniques!! 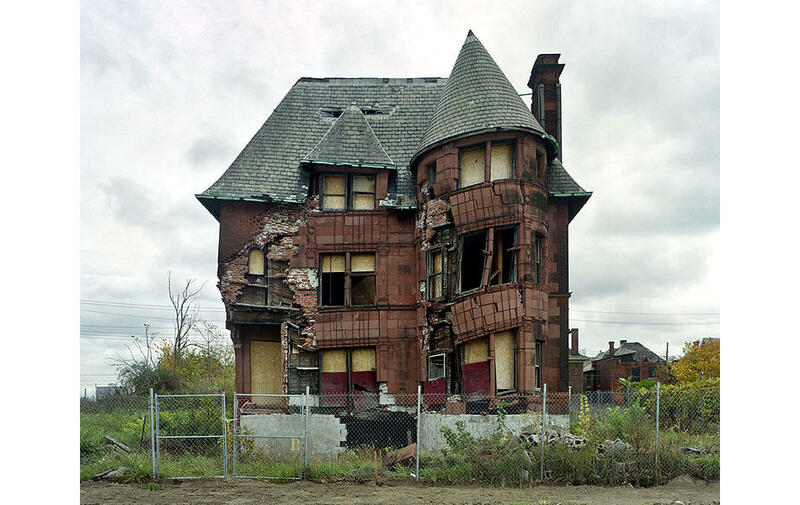 What a shame about that house–it must have been gorgeous in its time. You’re just an amazing storyteller. I love reading your posts. The stories around the houses are fascinating. Thank you so much for sharing!